Or The Catlactic Empire Wants YOU! “Sir, Sir!” A seemingly disembodied voice called to him from his dreams. 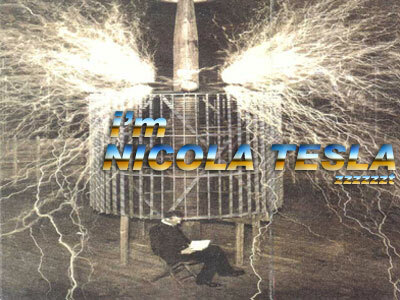 I am Nicola Tesla, inventor of the Tesla Coil! Today I joined Emperor Ming and his daugher Princess Maria-Theresa to the movies. What is fitting for 'Good Friday' (as the Americans call the day before Eastern - hey, someone MUST have had a good time there after all!!! NOT!?)? Well, you already guessed it: Mel Gibson's attempt of depicting 'The Passion of The Christ'. Rascal Goes for a Ride? The cool evening air seemed like any other evening. The food was left for the cats and all our cats had come to eat, except one. My daughter and I were about to retire for the night. Every evening our large orange and white shorthair cat would come to the door and request entrance. Without fail, here he would be at the appointed hour. The appointed time came and went. My daughter comes to me concerned. “I don’t know. Have you looked for him?” I started to walk around the house. I always call him my best friend, guardian of my home and top mouser. He shuts his eyes halfway as to say, “You are privileged to know me and you are welcome.” I swear sometimes I feel as though he is not a cat at all, but some mysterious being hiding in a cat body to protect me. In a way, I feel he is like a guardian for my home. Back to the search…we searched inside the house too, just in case he was hiding under the table or sleeping under a bed. It was hard to see the worried look on my daughter’s face. Sure, she was 17, but she loved that cat. She finally went to bed and only my younger son and I were up. The curtains in the back of the house were open and a bright flash caught my attention. I gazed out the back window along with my son and we saw it lit up like bright noonday. Actually it was brighter. It was more a bright, pure white light. The entire yard was illuminated with no shadows at all. The light was not moving in anyway. I thought it rather odd. There was no sound. I figured it was a search helicopter doing the rounds. I rushed to the front of the house and there was nothing. No helicopter, no sound (they are very loud). It was absolutely silent except for the distant roar of the freeway. My daughter and son came out to see what I was up to. A few moments later, Rascal comes sauntering out of the back yard as if nothing had happened. I told the story of the light to my daughter and she scowled at me suspiciously, until my son piped up and supported the whole story with his version. You tell me…what is up with that? Sometimes I wonder if he went for a ride. “Rascal, the UFO riding cat.” Now when I look at him in the eyes, he pretends to be just any cat. If I look at him long enough, I swear he’s smirking at me! 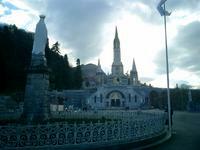 Today we drove to Lourdes. Which is a little town in the foothills of the Pyrenées visited by more than 5 million people each year, as it is a major catholic pilgrimage site. It is a beautiful and peaceful place, well placed next to some spectacular mountains. But it is also a strange town. There's almost nothing but lots and lots of hotels and souvenir shops there. And it all leads towards The Grotto. Which is a little cavity in the side of a big rock, in which you find a small spring. And it is the water of that spring that has been reported to produce lots and lots of miraculous healings and miracles in general. And I'd believe that. Well, whether the water really does anything or not, I don't know. But there's an impressive atmosphere set up for the purpose, and enough people who believe it and take it very seriously, that miraculous occurances would quite naturally occur. On top of the rock where you find the grotto there's a large and spectacular cathedral-like church with an impressive set of stairs leading up to it, and a very impressive entrance. We were obviously there outside the season, as there wasn't really that many people, and it was clear that the whole arrangement was expecting tens of thousands of people at a time. 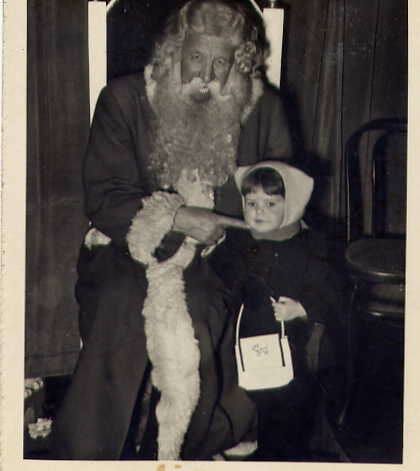 You line up for the entrance into the grotto, where I suppose you'll know what to do if you're a good catholic. The rocks are black and smooth from being touched by millions of people. And you buy large candles that you can light and leave in an area for that purpose, together with a prayer. So, we did stock up on healing water from Lourdes. You can buy many kinds of containers in the shops, which you fill yourself from the spring, but we didn't go for the 5 liter models, just some little ones. And the water tasted nice and fresh. I remember this SO well ! Yesterday, on a beautiful afternoon as we were driving home to Minneapolis from visiting family in Wisconsin, we were treated to one of those rare beautiful, crystal clear late-fall days. A stark blue/white and gray sky, the visibility infinite, and a sharp, cold wind out of the North. Driving along U.S. Highway 10, the road winds in, out, and through the central Wisconsin hills. At times, when the road tops over a hill, you can see forever. It is a beautiful sight - the stark november sky, leafless trees, and brown, harvested fields. It leaves one with a sense of wonder and mystery at this world God has provided for us. And with wonder is a sense of mystery. Why? Several interesting things occurred in recent weeks that have served to focus my attention on the mysterious and the climactic. At the most general, there is simply the year-end - the approach of the winter solstice, holy days in nearly all religions. Yet there is a more specific sense. As one travels, one can sometimes sense a deep underlying interconnectedness. A sense that each house, each person, each small business along the roadside - each thing is interconnected with all others. One can sometimes sense an almost-visible web of being that interconnects each person, and each work of humanity or nature in an almost-tangible way. Another mystery is one that perhaps being an anomaly researcher affords, that one might not otherwise notice. This comes from having looked into a number of rural sightings and close encounters in recent months. Among residents of the area, these are seldom discussed - especially with outsiders. Yet, sighting report databases indicate that the area we were driving through has had a bountiful history of recent anomaly sighting/encounter reports. So as I drove through the rolling hills, fields and woods of central Wisconsin, I could only wonder - In which of the farm-homes in the distance, did someone have a truly fascinating story to tell?